The Nepal earthquake disaster launched a global humanitarian effort in 2015. Even as the dust still settled, space-based information aided the nation’s recovery… and watched for new hazards. A massive 7.8-magnitude temblor, the Gorkha earthquake struck just before noon local time on April 25, 2015, along the boundary where the Indian plate underthrusts the Eurasian plate. Lasting less than a minute, the initial earthquake left approximately 9,000 people dead, with additional quakes and aftershocks continuing for months. This unprecedented approach tapped many resources including Landsat satellites, the Earth Observing-1 satellite, the Advanced Spaceborne Thermal Emission and Reflection Radiometer instrument aboard NASA's Terra satellite, as well as DigitalGlobe satellites and image mosaics. This crucial optical data helped initially determine what regions were damaged or destroyed by the quake, and where to target relief efforts. Helping this rapid flow of information was ICIMOD’s already-established presence in the region. To aid recovery and speed assistance, ICIMOD gave frequent briefings to Nepali government agencies, including the Ministry of Home Affairs. They also provided high-resolution printed images of the quake damage. These paper maps were critical pieces of support as the nation had limited Internet service, which at times delayed the immediate information the nation desperately needed. In addition to the initial destruction of the Gorkha earthquake, the region had yet more risks to consider—additional hazards spurred on by the quake and its aftershocks. Those threats included landslides and avalanches, as well as flash flooding caused by blocked rivers and breached glacial lakes. As a partner in NASA’s disaster-relief response, the University of Arizona organized a team of scientists—a volunteer network with people across nine nations—to identify where landslides occurred in earthquake-affected areas of Nepal. In the immediate weeks after the quake, the team used spaceborne and ground observations to collectively map more than 4,300 landslides. Smaller subgroups of the volunteer network focused on assessing and communicating the disaster, creating damage proxy maps, and producing vulnerability maps that showed potential risks. Jeff Kargel, a glaciologist at the University of Arizona, co-led one subgroup with NASA scientist Dalia Kirschbaum, called the “Induced Hazards” team. This team concentrated on identifying the landslides and other hazards triggered by the quake, as well as guiding relief efforts. In one instance, a colleague of Kargel’s at ICIMOD alerted him in the middle of the night to an urgent situation facing the village of Beni, located at the confluence of the Kali Gandaki and Myagdi Rivers. That village was one of several downstream from where a landslide dam had built a sizeable lake in the river flow. The colleague asked Kargel to use the data he’d collected to provide calculations of downstream flooding if the landslide dam were to break. Within a matter of hours, Kargel relayed that information and authorities evacuated the villages. In the months following the earthquake, the volunteer network knew more hazards were still potentially ahead. Aftershocks still jolted the region, and the monsoon season was coming. With the ground already unstable from the quake, the likelihood of landslides would be much higher when the rains came. 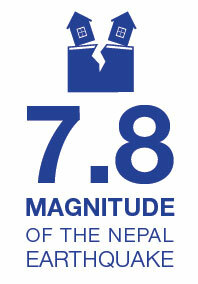 More than 75 people and organizations contributed to NASA’s response to the Gorkha earthquake and associated hazards.